Today, I thought I would share with you an amazing knitting booklet I recently purchased on eBay. 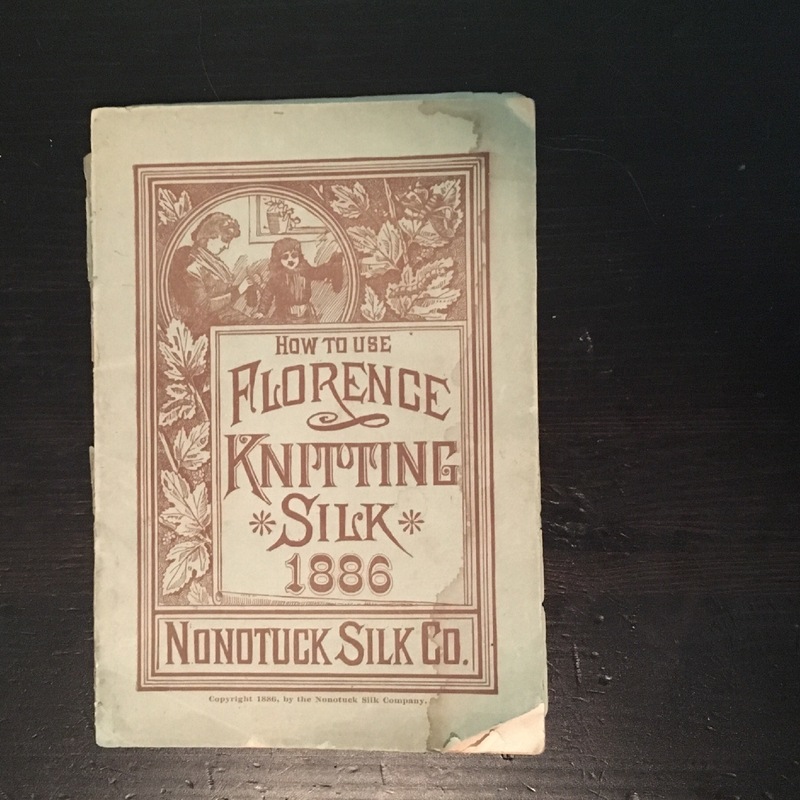 The book is called How to Use Florence Silk, 1886 and was published by the Nonotuck Silk Co. My copy of the booklet is quite fragile; which is to be expected as it is 130 years old and unfortunately I cannot flip through the pages without fear of them falling apart. The book is small, measuring just 5″ wide by 7.25″ high and is 96 pages long. It would have tucked very nicely into a knitting basket and seems to be a practical resource. A copy of this book will be mailed by the Nanotuck Silk Co., Florence, Mass., to any address on receipt of three tw0-cent stamps. What a great little book for the price of $0.06! The booklet is also available on-line here if you would like to take a look at some of the patterns. There are some lovely patterns for mittens and some details on the rules of knitting which are both useful and delightful. 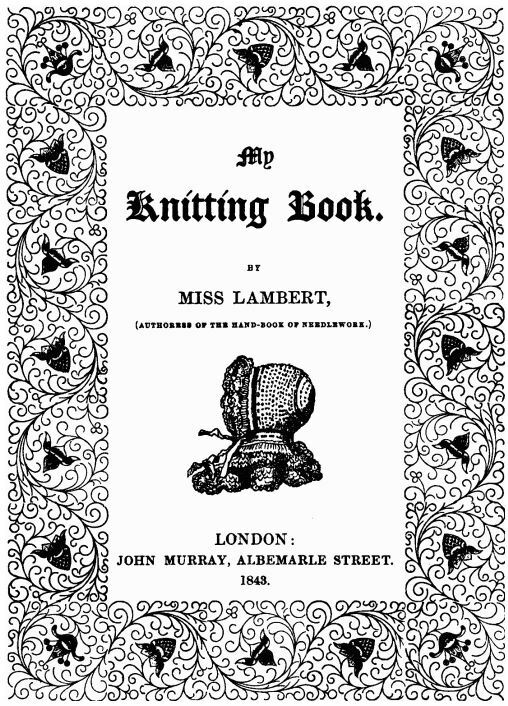 Intrepid knitters of historical and antique knitting patterns have completed several projects from the booklet and posted them on Ravelry. I can’t wait to try some of them out myself! I was curious to learn more about the Nonotuck Silk Company. I don’t know much about them, although I have seen the name quite often when looking through vintage knitting books on-line. I did a quick search on-line and discovered an article published in 2002 entitled The Invention of Machine Twist: the Nonotuck Silk Company, from moths to millions by Marjorie Senechal. Through this article, I learned many things I didn’t know before. People raised silk worms as a hobby in the 1800s. In 1838, Samual Whitmarsh purchased an estate near the center of Northampton, Connecticut and built a cocoonery for two million silkworms as well as two greenhouses for mulberry shoots (silkworm food) next to the mansion. Silkworm raising was a popular past time in the 1820s in this area of Connecticut. This was the beginning of what would eventually become the Nanotuck Silk Company. There was a mulberry bubble in the stock market. The interest in silkworm farming caused a lot of speculation in mulberry trees. 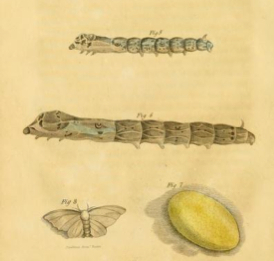 By 1830, John D’Homergue and Peter Duponceau reported to the U.S. Department of Agriculture that “suddenly and by a simultaneous and spontaneous impulse the people of the United States have directed their attention to this source of national riches…Everywhere, from north to south, mulberry trees have been planted and silkworms raised.” Mr. Whitmarsh grew the Northampton Silk Company until the mulberry craze ended with the mulberry crash of 1840. After the crash, Mr. Whitmarsh withdrew from Northampton, bankrupt. The factory was run by an abolitionist utopian community. In 1842, a group of abolitionists purchased the mill intending to create a utopian community called the Northampton Association for Education and Industry (NAEI). The NAEI continued the tradition of silk growing and manufacturing with a population of 120 men, women, and children, most of whom lived in the factory, until 1846, when the organization dissolved. The famous abolitionist Sojourner Truth reportedly lived and worked at the NAEI before its dissolution. The invention of machine twist threads for sewing. Samuel Hill started silk thread manufacturing a few years later and devised a silk thread that was strong enough to work with the newly invented sewing machine without snapping. This lead to great investment and interest from Mr. Singer, the inventor of the sewing machine. The Nonotuck Silk Company was incorporated in 1866 and closed during the Great Depression in 1932. Did I ever mention how much I love learning new things abou history?! < Previous Conquered: WIP No. 1!